© Barry William Shandro M.Ed. Elliot’s Horse was the title given to a Legion of Frontiersmen squadron from Victoria, British Columbia who were organized and equipped for overseas service immediately after the 1914 call-to-arms. – This historical information may be of particular interest to the Royal Canadian Dragoons and perhaps the Lord Strathcona’s Horse (Royal Canadians) as well. According to a surviving partial document from the Legion of Frontiersmen Calgary Command and other sources, “Elliot’s Horse” was a squadron composed of Legion of Frontiersmen from both Victoria and Vancouver Commands. This “free-lance cavalry” was sponsored by R.T. Elliot KC of Victoria B.C. The 1914 news of the day stated that “Elliot’s Horse” was to be composed of men who could fulfill the recruiting requirement of being “veterans with previous active service”. The squadron list of 83 men indicates that most of the men wore one campaign medal or more, primarily the Queen’s and/or King’s service medals for the South Africa War. Other medals worn by the Legion of Frontiersmen re-titled Elliot’s Horse were the “Indian Frontier Medal”, Khedive Medal, Natal Native Rebellion Medal, Matabele War Medal, and “Mexican Madero Medal”. A detailed firsthand account by Colonel W.K. Walker DSO, MC published in 1936 stated that although he had not seen active service prior to his 1914 enrolment he had Officer Training Corps experience and was able to join Elliot’s Horse. Once overseas he was subsequently elected* officer in command. *Note that the election of officers was a unique practice followed by the quasi military Legion of Frontiersmen active throughout the British Empire. Upon departure from Victoria, Elliot’s Horse was reviewed by the Lieutenant Governor of British Columbia, the Premier of B.C., Victoria’s Member of Parliament, the Mayor of Victoria and the squadron Founder Mr. R.T. Elliot KC. Beyond the uniform illustrated, Spencer’s Department Store of Victoria provided boots and under clothing for the Squadron. The store owner Victor Spencer “became a colonel in the Canadian Army Service Corps and held a very responsible appointment.’’ [The Daily Colonist, 08 Nov 1936]. The regimental placement of each member of Elliot’s Horse has not been researched; however, Colonel Walker DSO MC commented that some members of Elliot’s Horse rejoined their previous British units and that Lieutenant Sloan had also rejoined his old regiment the Scottish Horse and was later killed in action. – G.H. Sloan was originally from Hamilton Command had become an Organizing Officer circa 1911 with Vancouver Command, Legion of Frontiersmen. – Walker also noted that Lieutenant H.L. Houlgate of Elliot’s Horse joined Lord Strathcona’s Horse as a trooper, later being commissioned into the 2nd Battalion Border Horse. As well a curious retrospective quotation regarding Lord Strathcona’s Horse follows: “In 1914 on the outbreak of the Great War, a contingent of the Canadian Command of the Legion joined Strathcona’s Horse and formed their own Legion Squadron distinguished from the other Squadrons by a distinctive flash” [Frontier Post, Autumn 1933]. – If correct, could this have referred to the members of Elliot’s Horse? More research is required regarding this matter. The badge worn by Elliot’s Horse was not described; however, it may have been the maple leaf badge of the Legion of Frontiersmen British Columbia Command. This bronze badge had slightly different versions indicating a homemade quality to some. The khaki uniform was described as follows: Stetson, a mackinaw jacket, khaki shirt, puttees and boots. A likeness of this uniform is illustrated and interestingly this style of a uniform was typical of most Legion of Frontiersmen Commands throughout the British Empire. Calgary Daily Herald, 17 Nov 1914. Untitled partial document, Loose pages 1 [2 and 3 missing]to 9, published by Calgary Command LF, 1915. University of Alberta Archives. The Sydney Morning Herald, 25 Aug 1919. Frontier Post, Autumn 1933. University of Alberta Archives. The Daily Colonist, Victoria BC, 08 Nov 1936. The Frontiersman (Corps of Imperial Frontiersmen, Hamilton, Ontario), Dec 1951. Legion of Frontiersmen Notebook, online document, 2017. 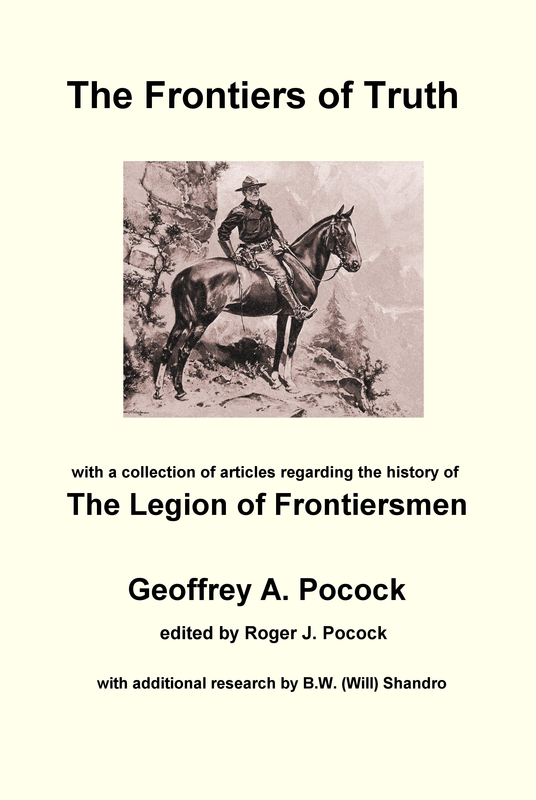 Refer to LEGION OF FRONTIERSMEN NOTEBOOK, a 91 page online document. Background of the Author – Barry William Shandro B.Ed, M.Ed, SBStJ graduated from the University of Alberta and the University of Ottawa. He was commissioned into the regular army, but resigned to pursue education and graduate studies. As well, he served briefly with Edmonton city police. – Overall, teaching high school was his primary career with a focus on family and community activities until disabled as a relatively young adult. During a period of forty years he maintained an association with the authentic Legion of Frontiersmen [Countess Mountbatten’s Own] and has pursued Legion of Frontiersmen historical investigation as a hobby. This entry was posted in Frontiersmen, History, Legion of Frontiersmen. Bookmark the permalink. Thank you for this, my great uncle joined Elliot’s Horse before transferring to the RCD so this is of great interest to me. He was Thomas Bond Steel.